I mentioned before that I have been driving for a while in South America and I thought it might be a good idea to give a semi regular update on weird things which have happened to me. I now need to go out and drive each day at around 6pm, which is the worst time of the day here. The traffic is not all that heavy but it is just getting dark and I would say that over 50% of cars here either don’t have any lights at all or else they only have one which works. Most motorbikes don’t have any working lights on them for some reason and I have yet to see a single bike with reflectors on it. Add in the fact that most people decide to overtake at roundabouts, when you are both pulling out of a side street or in the face of oncoming traffic and you can see how interesting it can be. My 4×4 is pretty old and yesterday the mechanism for opening the bonnet gave up the ghost. My local mechanic (who measures under 5 foot and looks like Maradona) told me to go and buy a new cable for it. I went back with the cable and it turned out that he meant another one so I had to make the whole trip over again. After a full morning of trying to get it sorted success was finally achieved. He fixes cars out in the street so I could watch as he pulled the old cable out and stuck the new one in. Which was riveting. I actually found out first on the BBC website that the police are on strike. I need to mention them here because of their unique way of collecting fines. My wife’s sister’s boyfriend (is there not a quicker way of saying that?) is one of many people who drive here without a licence. Or insurance. Or the faintest idea how to drive. Anyway, he told me the other day that when the police stop him they let him off provided that he buys them a drink. This seems to work well for everyone concerned. He gets to drive without worrying about all that annoying paperwork and the police just keep an eye out for him whenever they are thirsty. 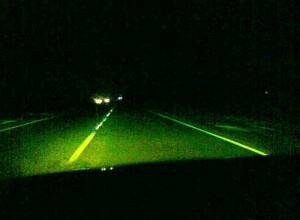 Would glow in the dark roads be a bright idea? This entry was posted in Musings, News and Views and tagged BBC, car, LS, MoT, South America, Striking Police by Robert Bell. Bookmark the permalink.